The European Commissioner for Development and Humanitarian Aid, Louis Michel, met Prime Minister of Ethiopia, Meles Zenawi, and representatives of the opposition, including those imprisoned at the Kalte detention centre, during a two day visit to Addis Ababa. He urged both parties to resume political dialogue, aiming at fostering the process of democratization. Commissioner Michel held talks with Ethiopian officials, the Parliament, representatives of civil society and members of the opposition in order to exchange views on the internal political situation. Meeting with Prime Minister Meles, Louis Michel welcomed the decision to grant him access to members of the opposition and journalists held in prison. “This is a positive sign, a sign of confidence, and I consider it a significant step in the direction of constructive political dialogue”, he said. During a three hours visit to the prison of Kalte, the Commissioner was able to meet with opposition leaders and journalists. He had an exhaustive exchange of views on the conditions of their detention, the charges against them and the prospects for a breakthrough of the current political situation in the country. He also expressed concern about the medical condition of some prisoners. The opposition leaders explained to Louis Michel that their main ambition is to resume the dialogue with Government on the package of democratic reforms. They also reiterated that they respect the Constitution and would not support any attempt to overthrow the regime. In response to a question by the Commissioner, Prime Minister Meles confirmed that international legal observers would be welcome at the trial against leaders of the opposition and members of the civil society and journalists, and that he was confident that this would be speedy and fair. “All the people I met here realise that there is no alternative to a sincere political dialogue”, the Commissioner said. In parallel to the dialogue, the Commissioner underlined “the need for other confidence building measures, quick and concrete”. He stressed the importance of ensuring a proper and effective functioning of the Parliament, in which the opposition can fully play its democratic role. The Commissioner was updated on the implementation and results of recent studies on parliamentary procedures and the media. Furthermore he expressed hope that progress will soon be made on the transfer of power in the Addis Ababa Council to the elected CUD party. The visit also included meetings with relatives and lawyers of the detainees, as well as an exchange with European ambassadors and the group of international donors. ADDIS ABABA, Feb 16 (Reuters) - The jailed chairman of Ethiopia's main opposition party may go blind if he does not get medical attention, members of a European Union delegation who visited him in prison on Thursday said. "We feel Mr Hailu's situation is of great concern to us. He requires appropriate medical attention as soon as possible," Altafaj said. "He may lose his eyesight if he does not get medical attention." Asked about Altafaj's comments, an information ministry spokesman told Reuters: "He (Hailu) is getting medical attention based on recommendations of doctors who are treating him." Western donors fund about 10 percent of Ethiopia's budget. ADDIS ABABA , Feb 9 (Reuters) - A pregnant reporter has been jailed in Ethiopia for more than two weeks, and Ethiopia's Information Ministry said on Thursday she had not been legally accredited. Press freedom advocates have criticised the arrest without charge of online journalist Frezer Negash, who works for the U.S.-based Ethiopian Review website, which is critical of the government. Fanthaun Assres, the head of journalist accreditation for Ethiopia's information ministry, said Frezer did not have the proper paperwork. "Frezer has not been accredited by the government as an Ethiopian Review correspondent. She is unknown to us," Fanthaun told Reuters. "If she had been working in Ethiopia as it was alleged, it was illegal." The website's publisher, Elias Kifle, has said she was properly accredited to work in Ethiopia. Press freedom watchdogs Reporters Without Borders and the Committee to Protect Journalists have criticised Ethiopian authorities for jailing her since Jan. 27 without lodging any charges. Reporters Without Borders last month called the arrest "deplorable because she is three months pregnant." The Committee to Protect Journalists has also said that Frezer had been threatened over her work on the website. Frezer appeared in court on Feb. 6, but no charges were announced and she is due to appear again on Feb. 21, Reporters Without Borders said. Ethiopia has come under fire for arresting reporters and charging some of them in a treason and genocide case lodged against more than 130 opposition members. Ethiopian authorities have said that the journalists accused in the case were not above the law because of their profession. Irish development aid may be propping up a corrupt government regime in Ethiopia, it was claimed today. Government forces killed several dozen protestors and jailed hundreds more since disputed elections were held last May. The Oireachtas Foreign Affairs Committee today held a discussion on the issue with Development Co-operation Minister Conor Lenihan and with NGOs in the sub-Saharan country. Mr Lenihan said the Irish Government contributed €35m aid to Ethiopia in 2005 but all further donations were under review in light of recent events. Mr Lenihan said the current unrest could be a temporary blip on an otherwise positive trend or the beginning of a downward spiral. “I hope it is the former, but I don’t discount the latter,” he said. “I intend to keep Ireland’s aid program to Ethiopia under constant review and developments like the internal crisis and the border dispute with Eritrea will influence the future development co-operation relationship between Ireland and Ethiopia. “I can assure the committee that if the circumstances dictate, we are prepared to take unpalatable decisions. The minister told TDs and senators that he will be guided by the situation on the ground, the EU and NGOs. He pointed to evidence of alleged election fraud, murder of villagers and banning of the free press. The Ethiopian government was fuelling tribal divisions which could have frightening consequences in the future, he added. “We are propping up what is obviously a corrupt regime,” Mr Allen said. The Irish government was recently criticised by GOAL chief John O’Shea who said state aid to the Ethiopian government in the current circumstances was flawed and misguided. Calling for a continuation of aid, Progressive Democrats Committee member Liz O’Donnell said Ireland must have no selfish political or colonial interest in Ethiopia, but must only be there to help. “We have to use partnership to make space for diplomatic dialogue. We must keep the relationship respectful of the sovereignty of the country,” she said. The Ethiopian People’s Revolutionary Democratic Front (EPRDF) government, led by Prime Minister Meles Zenawi denies claims by the Coalition for Unity and Democracy (CUD) opposition that it rigged the ballot. Hundreds of Ethiopian civic, political and religious activists rallied yesterday in the District for U.S. support in stopping the slayings and jailings of friends and relatives who oppose the African country's leader. Since November, more than 40,000 journalists, professors, students and opposition party leaders have been jailed on charges of treason and genocide, and at least 80 have been slain by the regime of Ethiopian Prime Minister Meles Zenawi, according to Amnesty International. Mr. Zenawi ordered the arrests after a dispute over results of the May elections. Opposition leaders from the Coalition for Unity and Democracy and the United Ethiopian Democratic Forces yesterday said dozens of women and children also have been slain or thrown into concentration camps. "We are trying to get the attention of the U.S. government, who gives major assistance to the [Ethiopian] government," said Merchaw Senshaw, a member of the Ethiopiawinet National Movement. "If you are fighting for democracy in the Middle East, if you are fighting terrorists all over the world, then why not Ethiopia?" The march began with a rally at Freedom Plaza and went along Pennsylvania Avenue to another rally on the U.S. Capitol lawn. Protesters from as far away as Canada and Europe attended the event. Earlier, about 300 Ethiopians from seven political and civic groups hand-delivered to the State Department a letter addressed to Secretary of State Condoleezza Rice. The Rev. Joseph Lowery, a civil rights activist and co-founder of the Southern Christian Leadership Conference, called on the U.S. government to hear the Ethiopians' plea. Rep. Dana Rohrabacher, California Republican and a member of the House International Relations Committee, said he was drafting a bill that would help the cause. Many demonstrators said they were frustrated that the United States had helped Iraq and Zimbabwe create democratic governments but ignored Ethiopians' pleas. "It is sad to preach democracy all over the country and then ignore us," said Dejene Assaye, 45, of Dallas. "As an Ethiopian-American, I don't want my tax money to go to this terrorist government to kill my own people." 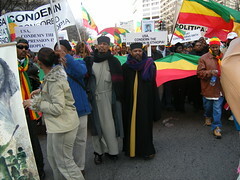 Hareg, a 49-year-old from Maryland who declined to give her last name, called on the United States to exert pressure on the Zenawi regime. "I get e-mails, telephone calls [saying] so-and-so has been killed," she said. "The country's under siege, and it's just unbelievable. ... All we want is democracy. "The Ethiopian people voted for the opposition; they exercised their democratic right. The price for voting is being killed." Mr. Zenawi yesterday told Reuters that rights groups' charges of widespread abuse of political opponents had no basis in fact and were the result of "sloppy" reporting. He also said the arrests and trials of opposition leaders were strictly lawful.